When you venture to your local grocery store, you always get overwhelmed when looking down the toothpaste aisle. All though you’ve been wanting to upgrade from the product you’ve been using nearly your entire life, when you take a trek through the oral hygiene section at Food Lion, all the boxes and tubes start to seem the same. How can you find out what type of toothpaste is best for you? You can follow these tips from Ascot Aesthetic Implants & Dentistry, your trusted dentist in Fayetteville, NC. What Is The Best Overall Type Of Toothpaste? Dr. Angela Ruff suggests that all patients should use a toothpaste that includes fluoride. This natural mineral is essential in strengthening the enamel on your teeth and protecting it against cavities and other issues that result from tooth decay. Stannous fluoride, a special type of this mineral, is the best option, since it’s naturally antibacterial and can help improve the health of your gums in addition to keeping plaque and tartar at bay – look for this ingredient and avoid Triclosan, an antibacterial agent that the FDA has seen fit to ban in hand soap, but not in toothpaste. What Toothpaste Should Kids Use? As your experienced and qualified family dentist in Fayetteville, NC, Dr. Ruff recommends that kids who are under 2 years old use toothpastes that are safe to swallow. This is important because these pastes don’t include fluoride, because swallowing this mineral can lead to dental fluorosis – while this mineral is great, too much of a good thing can leave permanent marks on your child’s smile. Always check the ingredients to make sure the paste is right for your little one. 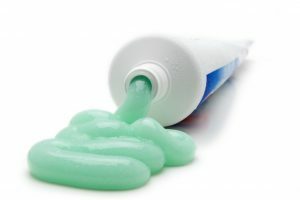 Once your child reaches the age of 3, you can use a pea-size amount of any toothpaste they like that includes fluoride. Flavors abound, so let kids use the tasty product they like, but continue to monitor them while they brush and make sure they spit this out, rather than swallowing. What Toothpaste Should I Use If My Teeth Are Sensitive? If your teeth are sensitive or you experience discomfort when eating hot, cold, or sweet foods, try using a toothpaste that’s specially formulated to address sensitivity. There are many products on the market that have fluoride in them and are created specifically to help with this common dental issue, so try a few until you find one you like. And, if sensitivity or pain continues, be sure to reach out to us, since this may be a sign of more complex dental issues that Dr. Ruff can address in her office. And remember, whatever toothpaste you opt for, you should always brush your teeth twice a day for two minutes – and be sure to see us every six months for the professional deep clean your smile deserves. Schedule your appointment with Ascot Aesthetic Implants & Dentistry today!